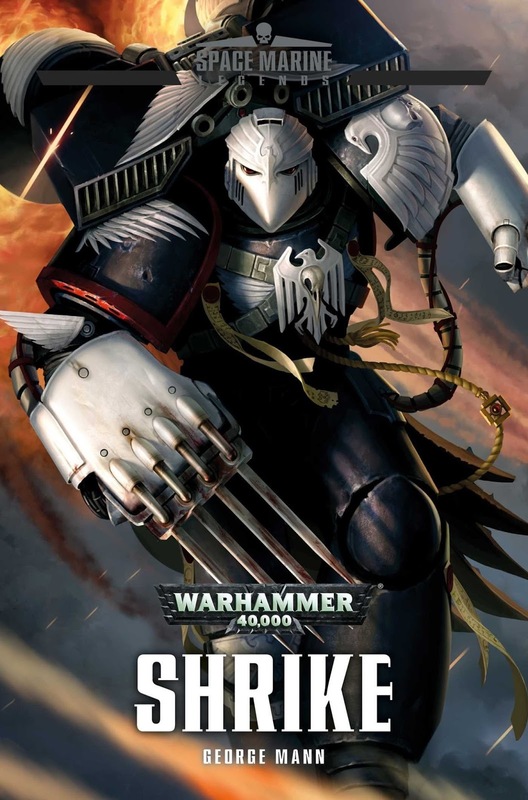 Vaunted warrior of the Raven Guard, Shrike has ascended the ranks of this most mysterious and deadly brotherhood all the way to Chapter Master. He is a legend amongst his battle-brothers, one that began humbly enough in the wilds of Kiavahr. Shrike has fought and bested many foes, but one in particular, the Ork Warlord Gorkrusha, dogged him throughout many campaigns. From veteran to Shadow Captain, Shrike clashed with his old nemesis time and again, determined to bring about a final reckoning and bloody vengeance to the greenskin. 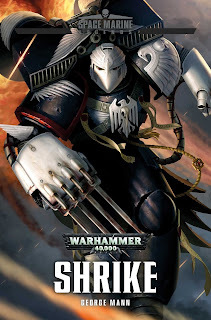 Another Space Marine Legends novel that takes the reader through the vaulted ranks of the Raven Guard from Novice through to Chapter Master and whilst it had potential to give the reader something pretty epic to enjoy, I felt more than a little let down as I really couldn't get to grips with the principle character. 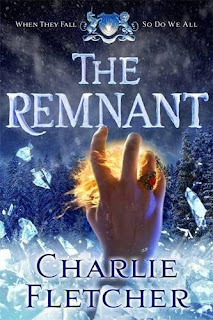 Yes the story had some cracking elements, the battles against mankinds foes enticing but for me, when I can't get to grips with a character I tend to feel that I don't really care for thier fate. All round a bit of a loss for me and a book I won't be returning to at any time soon especailly with other better Legends books out there. 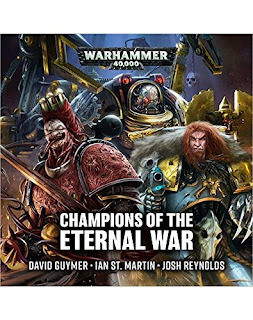 A Warhammer 40,000 audio drama collection Enjoy three full-cast audio tales of heroes and villains from the Dark Millennium: the doughty Iron Hands warleader Kardan Stronos, the sinister blademaster Lucius the Eternal, and the mischevious Space Wolf Lukas the Trickster. This is the first time on CD for these three tales of adventure, mayhem and (with Lukas) mischief from some of Black Library's finest authors - and all are full-cast dramas, with music and sound effects for a truly immersive experience. Heed now three tales of the Champions of the Eternal War... 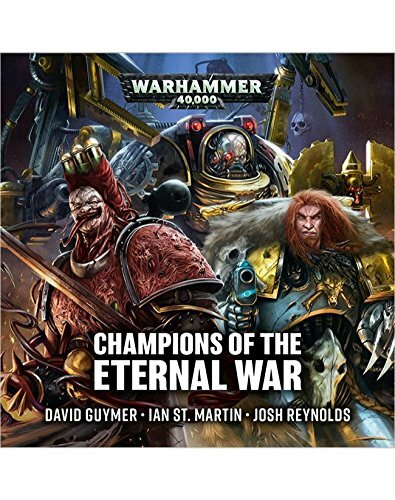 The Calculus of Battle by David Guymer As the defenders of Varasine battle a tyranid invasion, Warleader Kardan Stronos and the Iron Hands come to their aid, measuring the Chapter's cold logic and strategy against the cost in human lives. 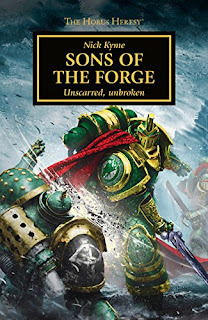 The Embrace of Pain by Ian St Martin When blademaster Lucius the Eternal is challenged by a champion of the Death Guard, he accepts without hesitation... but could a daemonhost of Nurgle, or the voices inside his own head, be the undoing of his Slaaneshi curse? 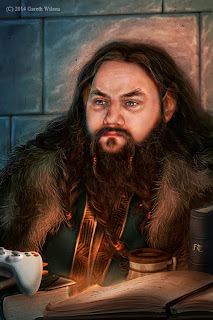 The Art of Provocation by Josh Reynolds When orks amass on Polix Tertius, Lukas the Trickster decides to play a dangerous game. Risking the ire of the Wolf Lords, he turns his attentions to the planetary vox, and begins to broadcast... Running time approx. 60 minutes. 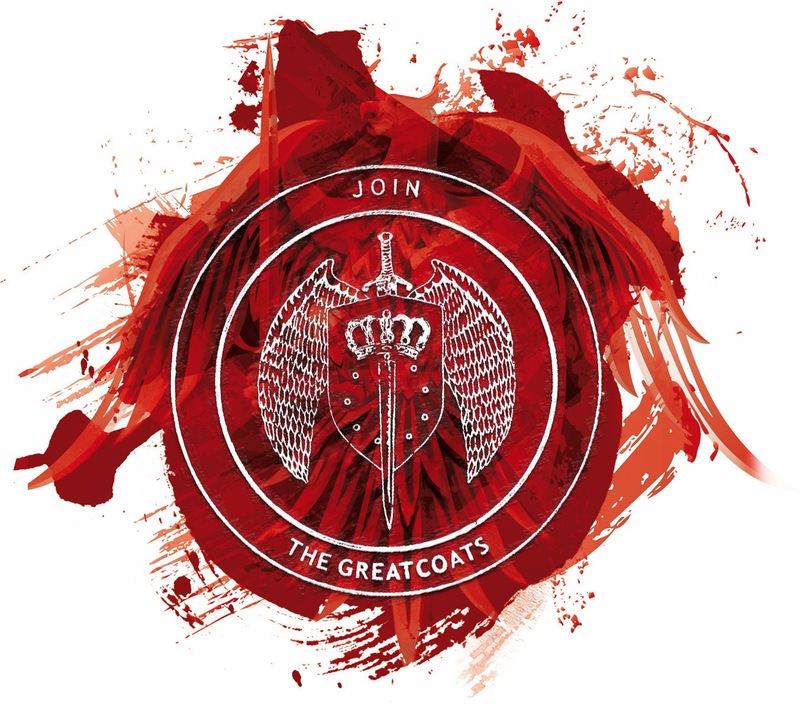 Performed by John Banks, Antonia Beamish, Robin Bowerman, Cliff Chapman, Steve Conlin, Jonathan Keeble, Toby Longworth and Luis Soto. 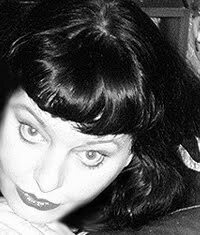 If you have a journey to do, whether its for work or for pleasure, there are times when you either can't take a book to read with you or you tend to feel ill whilst looking at the page. 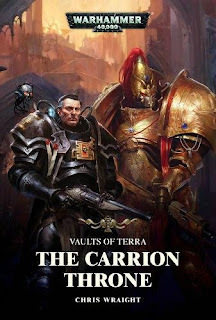 Well for me, this is where I love to have my MP3 player loaded with not only music but audio books and for me I love the way that Black Library brings these titles to life in such a way that they transport you to that time and place. 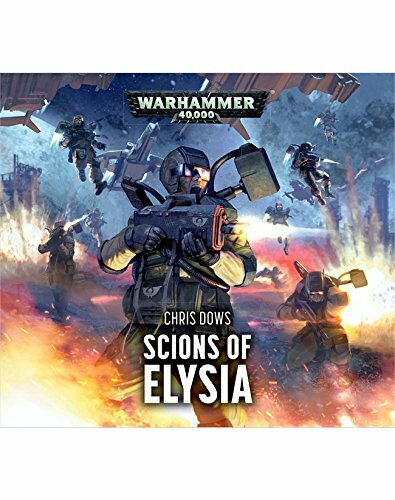 As with the other tales from the publisher, this one blends top notch story telling alongside magical voice acting and when added to the library of what has gone before really makes it something unique to sit back and savour. All round another cracking addition and one that will get quite a lot of use from as I'm being sneaky and introducing my nephews to these titles with a lot of positive results. 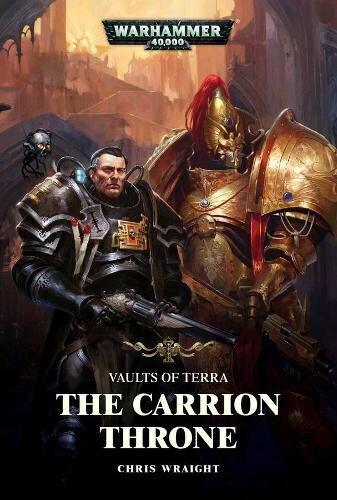 Another cracking MP3 story from the Black Library that transports you into the bleak 40th Millenium as mankind struggles to survive against its many foes. Beautifully written with cracking vocal talent alongside an arc that just keeps giving all round makes this a wonderful piece of narrative audio that will more than entertain. Finally throw into the mix a cast that you want to spend time around and for me, its a title that will more than entertain on other future journeys. Cracking. 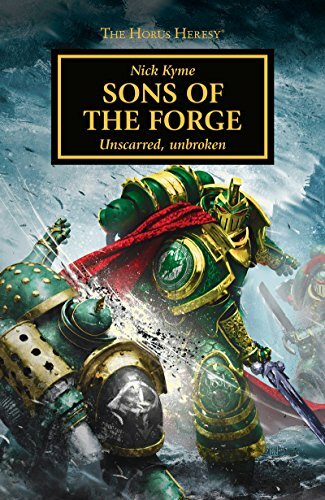 Getting to see an origin story is one of the things I love about diving back into the Horus Heresy and to be honest its one of the reasons you have to read Nick Kyme's Sons of the Forge as the reader accompanies Forgefather T'Kell on his journey to hide the artifacts of the Salamander Chapter that future generations will attempt to reunite. Its a cracking story, high octane action, top notch prose and of course the reader gets to the see the effects of this mission play out amongst his unit. 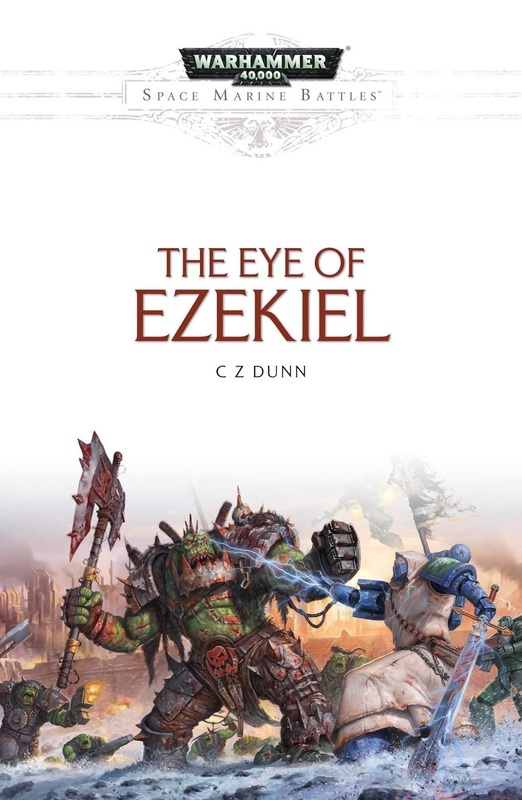 Add to this a story arc that works wonderfully well for the misfortunes of 40K and all round I was a more than happy reader. 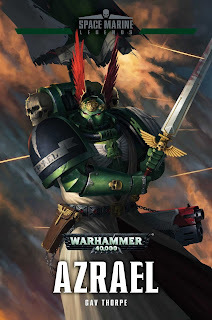 Another cracker and a must for Salamander fans. As a fan of the Warhammer 40K universe I love spending time with the primarchs and learning of how they elevated to thier positions and whilst I've just enjoyed Azrael, I found this one by Guy to be richer for me. 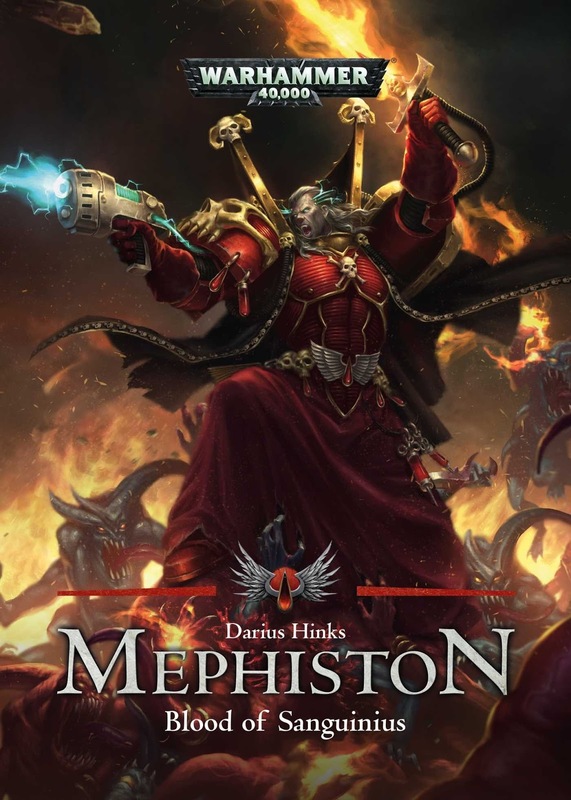 I loved the way that we danced through the heroes history, as battles took their toll alongside the curse of the Blood Angel line. 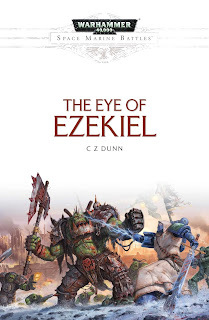 Its wonderfully rich, brings a great sense of history to the fore and when added to top notch battle sequences alongside cracking lulls to allow you to gather your breath all round makes this a book that will remain a firm favourite of mine for quite some time to come. A magical outing and one that I hope is followed up upon as I really can't wait to see what happens for not only Dante but the Blood Angels chapter. I love a story that takes readers on a journey with the legendary heroes of the Space Marines, however for me, this short tale could have been extended wonderfully by enriching the heroes past with exploits that helped make him a stand out candidate for the post of Supreme Grand Master. 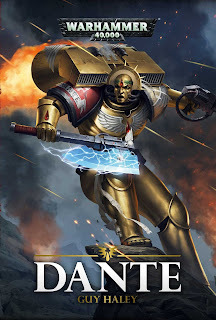 Yes we had some solid flashbacks to him as a normal human but for me, its the choices made and heroism demonstrated as a space marine that should have been the key for this book. 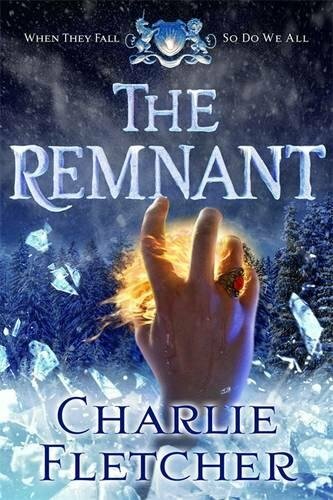 Thats ot to say its a bad book, far from it, the writing is crisp, the prose sharp and the battle sequences work wonderfully well. However for me, I really wanted a bigger build up to his elevation and hope that subsequent titles will do that.